This year’s Entrepreneurial Leaders Conference in Toronto on Nov 16th delivered a premium, one-of-a-kind experience, cementing its reputation as the single most important event for Christian marketplace and entrepreneurial leaders in Toronto each year. The international roster of speakers delivered amazing insights, capped by John Maxwell’s presentation which garnered a standing ovation. The collaborative effort spawned from broad-based support has no equal. The event is led by a group of ELO advisors, sponsors, exhibitors, table hosts and volunteers. Attendees came from throughout the GTA and southern Ontario, across Canada, the US and as far away as St. Lucia. Approximately 325 people attended the event. The buzz was in the air. The event was MC’d by Dr, Richard (Rick) J. Goossen, Chairman, ELO. There were four individual presenters. Russ Crosson, CEO, Ronald Blue & Co, Atlanta, GA, talked about having your financial priorities reflect your life priorities. Misty Lown, Founder, More Than Just Dance, Wisconsin, spoke about her entrepreneurial experience of growing a company in a very competitive industry. Stephen Green, former Chairman and CEO, HSBC Group, gave a big picture perspective of Christian businesses in interesting times. Paul Lafrance, CEO, Lafrance Design, talked about authenticity and vulnerability as new benchmarks in leadership. There was also a panel discussion on “The Power to Overcome,” chaired by Peter Legge, a Vancouver based entrepreneur and speaker. The panelists included Brad Pedersen, Tech4Kids, Mike Reinders, Maple Reinders and Rob Wildeboer, Martinrea Inc. The panels talked about overcoming challenges and there was a Q & A with the audience. The evening session included a standup interview of Lorna Dueck, CEO, Crossroads Communications, by MC Rick Goossen. They talked about Lorna’s new leadership role and the collaboration between Crossroads and ELO to do interviews with marketplace leaders. 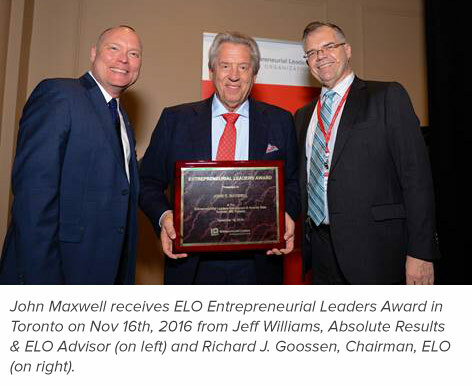 The highlight of the evening was the presentation of the “Entrepreneurial Leaders Award” to John Maxwell. Jeff Williams, President, Absolute Results, Vancouver shared about his connection to John Maxwell and their work through the John Maxwell Leadership Foundation. Jeff Williams and Rick Goossen together presented the Award to John Maxwell. John Maxwell then spoke on the topic of “Intentional Living.” With his rich baritone voice, his unique ability to connect with people, a number of great insights, and his trademark humour, the 45-minute presentation seemed to last only a fleeting moment. He received a spontaneous and heart-felt standing ovation. All attendees who completed the response forms indicated that they would recommend the conference to others and that they want to know if advance regarding next year’s event—tentatively scheduled for Wed, Nov 15th . "I'm so grateful attended. The speakers were fantastic, new connections I made, invaluable and a renewed motivation to blend my faith with the work I do in the marketplace." - John G. Charles, President, The Corazon Group, Castries, St. Lucia. “I find this to be a stimulating conference of testimonies of grace from backgrounds of uncommon people. Good communication of ideas and encouragement.” - Roger Wingfield, Associate Insurance Broker, Broker Force Insurance, Toronto.